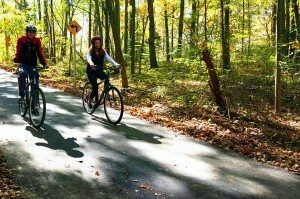 BATAVIA, Ohio (Oct. 15, 2015) – Walkers and cyclists christened the newest segment of the Williamsburg to Batavia Hike/Bike Trail, which opened with a ribbon-cutting on Oct. 15. With this segment, the trail is now 6 miles long. The trail, which will be 15 miles long when completed, is a combination of shared roadways and paved paths. It runs from Williamsburg to the East Fork State Park Campground and now to Zagar Road in Batavia Township. Chris Clingman, Director of the Clermont County Park District, welcomed guests including James Zehringer, Director of the Ohio Department of Natural Resources, Health Commissioner Julianne Nesbit, State Sen. Joe Ueckerand State Rep. Doug Green. The newest segment of the trail was funded by a $50,000 grant to Clermont County Public Health from Interact for Health through its Physical Activities Environment Grant Program. Megan Folkerth, program officer at Interact for Health, said “active living” was an important component of the foundation’s programs. “We’re very excited to be part of it,” she said. To date, approximately $1.18 million has been raised for the bike trail through grants and fund-raising. Funding has come from federal Transportation Enhancement Grants, state capital project grants, townships and villages, as well as the private sector. Clingman praised the beauty of the trail. “This trail is like taking a ride down an old country road. It takes you past fields, through woods, up and down hills, across creeks to some of the most scenic spots in Clermont County. 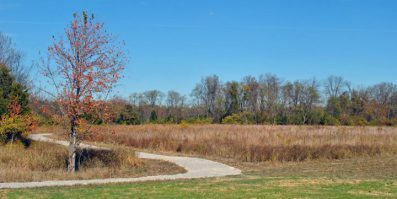 “Along the route there is an overlook of the East Fork River Valley, a wetland with observation deck, overlook of Harsha Lake, and a view of small waterfalls in Cain Run Creek, “ he added. Village of Williamsburg, Village of Batavia, Williamsburg Township, Batavia Township; U.S. Army Corps of Engineers; Ohio Department of Natural Resources; Clermont County Engineer; Clermont County Public Health; Clermont County Water Resources Department; Clermont County Commissioners; OKI Regional Council of Governments; UC Clermont, and the Clermont Family YMCA.